By the time the 11th Territorial Legislature convened in 1933, close to 15 million Americans had lost their jobs to the Great Depression, and national unemployment was around 25 percent. The first act passed by the Legislature this session authorized the Territorial Banking Board to declare banking holidays and postpone payments of deposits. 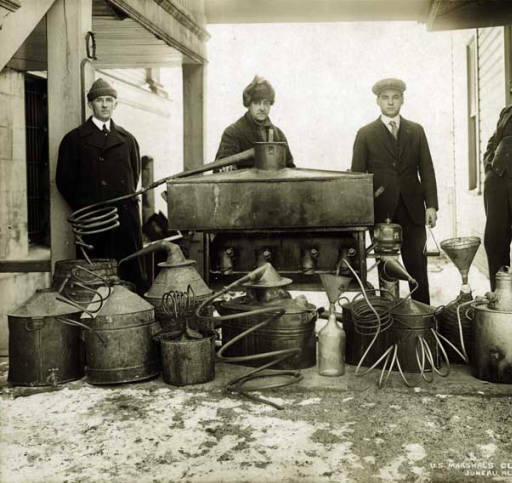 The second act overturned the "Bone Dry Law," ending prohibition of alcohol in the Territory. The Legislature also created the Board of Liquor Control, and enacted measures to regulate the sale of beer and wine through licenses and fees and to prohibit the sale of beer or wine to minors or intoxicated persons. The national economy began to rebound as Franklin Delano Roosevelt assumed office and quickly passed the first programs of the New Deal for "relief, recovery, and reform." The Legislature declared that the economic depression had created a serious emergency in Alaska, and authorized the Governor to petition the federal government for aid and to accept any and all grants. By the end of the session, work relief projects were slated to be carried out with federal funds throughout the Territory, including numerous road and airport projects. The Legislature made its own appropriations for work relief as well, including $225,000 from the Territorial Treasury for the construction of Pioneer Homes. The Legislature passed a law allowing women to hold any public office in the Territory. With an eye on high male unemployment, however, the Senate also passed a resolution stating its opposition to the Territory's schools and offices employing women who had gainfully employed husbands. The Legislature continued its efforts to connect the Territory's distant populations, making appropriations to install and maintain radio telephone systems, and authorizing the Governor to employ radio stations north of the Gulf of Alaska to disseminate news and information about the Territory. In 1933, about 80 percent of Alaska's revenue came from taxes on commercial fishing. New regulations on fishing licensing allowed only U.S. citizens to fish commercially in the Territory. The Legislature also created the Office of the Treasurer, the Board of Education and Commissioner of Education, and the Board of Children's Guardians; required written contracts for investing in mine prospects, commonly known as "grubstaking"; required commercial aircraft to carry insurance; and established ways to place liens on mines, oil wells, warehouses, canneries, sawmills and others in response to nonpayment of workers. Numerous "New Deal" programs are established, including the Civil Works Administration, Civilian Conservation Corps, Tennessee Valley Authority, the Federal Housing Administration and the Public Works Administration. The 21st Amendment to the Constitution ends prohibition in the United States. The Dust Bowl begins, with severe droughts and dust storms sweeping over the Great Plains, leaving more than 500,000 people homeless. President Roosevelt appoints Ernest Gruening head of the U.S. Division of Territory and Island Possessions. His first assignment is to promote agriculture in Alaska by moving people to the Matanuska Colony. Japan withdraws from the Five-Power Naval Treaty of 1922. Anthony J. Dimond, Alaska's delegate to Congress, advocates for air and naval bases in Anchorage, Fairbanks, and the Aleutians, although it will be years before appropriations are finally made. Adolf Hitler and the Nazi party come to power in Germany.